It seems Samsung Galaxy S IV is now taking over the world, especially the Android world. With Korean media uncovering the specs of Galaxy S IV, something about the successor to Samsung's blockbuster Galaxy S3 is cut and dried. As report goes, Samsung Galaxy S IV is equipped with 5-in FHD touch screen at 1080P, Cortex-A15 Quad-core processor and Android 5.0 operating system. Now that Samsung Galaxy S IV offers us a splendid visual entertainment, many Samsung fans cannot wait to watch DVD movies on this genius big-screen smart phone. But the sad truth is that you cannot import DVD to Galaxy S4 directly for this gadget is still devoid of DVD drive. This is why many DVD rippers spring up in the market, aiming to enable you to rip DVD to a format that is optimized for your gadget. To name a few, you can make a try with MacTheRipper. But one thing here I have to mention Mac The Ripper update is not available, especially when it comes to Samsung’s new version Galaxy S IV for the official MacTheRipper site has been shut down with support team no longer existing for the software. Don’t panic. If you are expected to convert DVD to Galaxy S4 for playback on the move, MacX DVD Ripper Pro is ready to serve as a professional DVD ripper, which allows you to tap into the latest Samsung handset as easy as possible, making you extract video files from DVD movie and convert to Galaxy S4/S5/S6/S7/S8/S9 preferred format, regardless of copy protections put on DVD. Delivering significantly improved performance on ripping speed, it enables to finish DVD conversion just in the blink of an eye. MacXDVD Software offers two versions to finish the task of DVD to Galaxy S4 conversion. 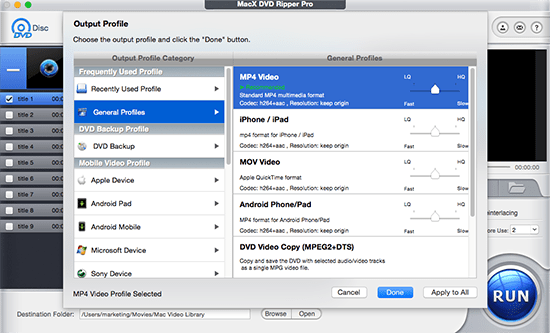 for Mac users, you can download Mac Version DVD ripper. For windows users, you can just download Windows Version DVD Converter on your PC. Free download and run this DVD to Samsung Galaxy S IV Converter on Mac OS X, import DVD by means of clicking "DVD Disc" button. Alternatively, you can import this disc by hitting "DVD Folder". For those who'd like to convert to Galaxy S4, you can simply choose "Samsung Galaxy S4" as the output format or rip DVD to MP4. This program offers more than 283 optimized output profiles for Apple iPhone (include iPhone 7/SE/6s), iPad (include iPad Pro/Mini 4),iPod, Apple TV, Android, HTC, Samsung, Microsoft Surface, PSP, Blackberry, Xbox and other handheld digital media players. Besides, optimized DVD video editing functions enable you to crop video file size, trim video segment and merge video files before DVD to Galaxy S IV conversion on Mac. After finishing the above steps, start ripping DVD to a format for importing DVD to this gadget by clicking "RUN" button. Aiming to be on par with or ever better than the most fevered DVD ripper like Handbrake, Mac the ripper, etc, this DVD converter also features a unique function to copy DVD Mac, which allows users to copy main DVD content or full title to hard drive for further use with original video quality. By the way, for those who'd like to watch YouTube video on Samsung Galaxy S4 for watch, MacX Video Converter Pro will help you to download YouTube Video and convert to Galaxy S4 friendly format with one fell swoop. To watch DVD movies on mobile devices, MacX MediaTrans can help transfer movie files to iPhone iPad etc. quickly by simple drag-n-drop. Wanna enjoy your DVD movies on Galaxy S3? MacX DVD Ripper Pro is you best choice, helping you rip DVD to Galaxy S 3 on Mac. Hence, you can watch the DVD you like on Galaxy S3 on the go. This article aims to tell Mac users how to convert DVD to Samsung Galaxy Tab for convenient HD video enjoyment with MacX DVD to Samsung Galaxy Tab converter for Mac.